Head of the archeological dig on Tel Tzafit Prof. Aren Maeir says the find indicates that the two peoples thought of as bitter enemies may have been closer than we think. 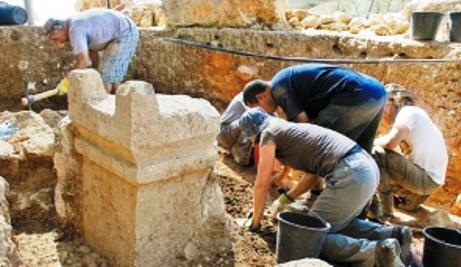 A stone altar from the 9th century BCE was found in an archeological dig on Tel Tzafit, a site identified with the biblical Philistine city of Gat. The altar is reminiscent of Jewish altars from the same period and sheds light on the cultural links between the two peoples, who fought each other for centuries. The altar is approximately one meter tall, half a meter wide and half a meter long. It was found by a team of diggers led by Prof. Aren Maeir of the Land of Israel and Archaeology studies at Bar-Ilan University. The most outstanding features of the altar are a pair of horns on its front and a cornice in the middle. Its form is reminiscent of the descriptions of the Jewish altars in the scriptures, with the most noticeable difference being that the altar in the Temple was described as having four horns, while the Gat altar has only two. Maeir has led the digging project at Tel Tzafit, in the southern coastal plain, for 15 years, with much of his work concentrated on the Philistine layer of the site. Gat was the most prominent and powerful city of the Philistines for much of that people’s existence, and Meir believes it was at times the largest city in all of the Land of Israel, until it was finally sacked by Hazael, king of Aram-Damascus, in 830 BCE. He said that the fall of Gat was the single most important geopolitical event of the century. Testimonies of the destruction, including a layer with thousands of pot shards, were evident in every dig at Tel Tzafit. According to Maeir, the fall of Gat and the weakening of the Philistine kingdom in the south of Israel was what allowed the rise of the Kingdom of Judea and the golden era of Judean kings in the 8th and 7th century BCE.